Elite tracker always finds her target. 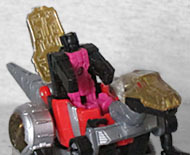 Slash absolutely looks the part of a Dinobot; her design is right at home among the boys. It's not just the colors, though those help - red, black, silver, and gold, like we got in G1 - but the actual shapes and design of her body. Look at her shoulders, for instance: they're big silver drums with clear yellow panels, allowing you to see the mechanical details sculpted within. 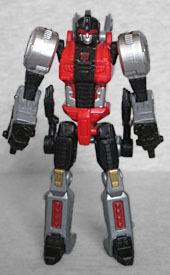 The chest and pelvis are red, with a silver waist between them and a large black line running down the center. The upper legs are black, while the lower are mostly silver, with gold on the knees and red on the shins, then black feet. Even the poorly disguised kibble (a pair of dino arms mounted right behind her hips) feels like an intentional throwback to the old style. 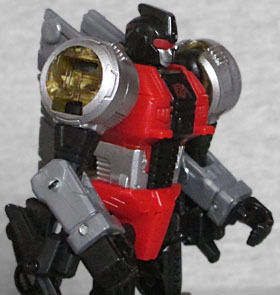 Even the head feels like a modern update of some vintage toy we never got. She's wearing a black helmet with a flat fin on top, and has red visor against a silver face. The articulation includes a swivel neck, balljointed shoulders, swivel biceps, hinged elbows, balljointed hips, swivel thighs, and hinged knees - definitely better than we would have gotten in G1! Slash is a Legends Class figure, so converting her is fairly simple: raise the tail over her head, turn her arms into dino legs, tuck her legs up, and unfold the dino's head. Simple as that! Slash really demonstrates the way pop culture has changed in the last 30-something years: in the 1980s, no one would have cared enough about velociraptors to make one of them a Dinobot, but in our post-Jurassic Park world, they've been elevated to the ranks of the other stock dinosaurs. That also explains why Slash is a femmebot: it's so she can be a "clever girl!" 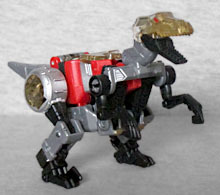 The colorscheme from the robot carries over here, maintaining Slash's essential Dinobotness. Following modern conventions, the raptor form has a horizontal posture, with the tail held aloft. The belly formed by the robot legs is less than impressive (there's a major gap all the way through the body right where the knees are), but it's pretty cool that they thought to sculpt the large claw on her feet. In this mode, she moves at the knees, hips, shoulders, head and jaw, and if you find you're having trouble getting her to stand in a normal-ish pose, you probably don't have her feet clicked all the way into place: there are squarish bumps on the backs that snap into the robot's hands for support, but it takes a solid push to get them in. A new year means a new gimmick for the Generations line, but this year's Legends Class figues still work like last year's: they can give rides to Titan Masters. We'd say that the big flat panel on Slash's back that opens to create a seat for the smaller figure is disappointing, but having it means the raptor's head tucks away better in robot mode, so we'll give it a pass. It still looks very flat, though. 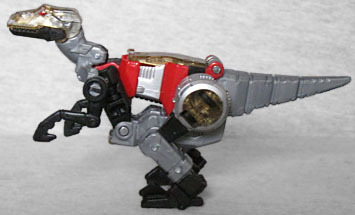 Even if you don't plan to get the other updated Dinobots, you may want to get Slash, just to add her to your existing Dinobot ranks. She's a new character who looks right at home with the old ones, and that isn't something you see every day.